In 2014, the Russian Federation acquired another Muslim group that may prove troublesome both within Russia and globally: the Crimean Tatars. According to the 2002 Russian census, there were only 4,131 Crimean Tatars living in the country, concentrated in Krasnodar Krai in southern Russia; the March 2014 annexation of Crimea, however, brought with it some 245,000 Crimean Tatars. The referendum, which allegedly showed an overwhelming desire of the people of Crimea to join Russia, was boycotted by Crimean Tatars (various Ukrainian and international media sources reported at the time that 95-99% of Crimean Tatars did not take part in the referendum; see here, here, and here; while Russian media stated that the proposed boycott did not take place). Also, reports surfaced in the social media and Ukrainian news outlets that Russian (para)military personnel were confiscating and tearing up passports of potential voters of Crimean Tatar background (see here, here, here, and here). 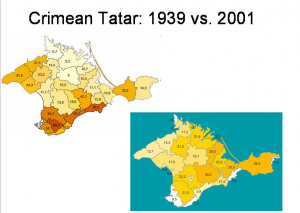 Crimean Tatars have good reasons for viewing the Russian annexation of their homeland with suspicion and worse: since the Crimean Peninsula was first made part of the Russian Empire in 1783, Crimean Tatars have been subjected to massacres, exiles, discrimination, and deportations. By 1897, they constituted only 34% of the peninsula’s population. After the Bolshevik Revolution, persecutions of Crimean Tatars continued throughout the 1920s and 1930s, marked by widespread imprisonment and execution. The confiscation of food to supply central Russia resulted in widespread starvation. According to some sources, half of the Crimean Tatar population was killed or deported between 1917 and 1933. Persecution reached its culmination on May 18, 1944, when the Soviet government deported the entire remaining Crimean Tatar population to Central Asia as a form of collective punishment for alleged collaboration with the Nazis during their occupation of Crimea in 1941-1944 (the reality of this purported collaboration is discussed in my earlier post). The deportation process, as described by the victims in their memoirs, was horrific. More than 32,000 NKVD troops participated in this action. The deportees were given only 30 minutes to gather personal belongings, after which they were loaded onto cattle trains and moved out of Crimea. The expulsion was poorly planned and executed; the lack of accommodation and food, the harsh climatic conditions of the destination areas, and the rapid spread of diseases generated a high mortality rate during the first years of exile. It is estimated than nearly half of the deportees died of diseases and malnutrition, causing Crimean activists to call it an instance of genocide. Even after Crimean Tatars were officially “rehabilitated” in 1967, they were not allowed to return to their homeland until after the fall of the USSR because, as some scholars explain, Crimea was seen by Soviet leaders as too geopolitically and economically crucial. Although many Crimean Tatars have returned to the peninsula since 1991, few managed to move into the areas of their historical settlement. Prior to the deportations, the majority of Crimean Tatars—members of the Tat and Yalıboyu subgroups—lived in the mountainous central and southern parts of Crimea and on the southern coast. These areas, and particularly the coastal region, are climatically favorable, protected by the east-west running mountains from frigid northern winds. But upon their return, most Crimean Tatars had to settle in the less desirable central and eastern parts of the peninsula. The initial reaction from Crimean Tatars has been “to resist through peaceful means”, says Hide. For example, a long-term media campaign led by Serhii Kostynskyi of Ukraine’s National TV and Radio Committee aimed to “expose human rights abuses and win back Crimea with ‘soft power’”. However, such attempts to draw the attention of international and domestic media to Crimea have been a limited success. The continuing fighting in the Donbass region of eastern Ukraine has deflected the attention of both politicians and the media, locally and internationally. Moreover, the majority of Crimea’s Russian-speaking population are happy to be part of Russia, even if it brought the peninsula little economic or social development. Thus, Crimean Tatars, who constitute a minority in their historical homeland, have little support within Crimea and have to look for an alliance elsewhere. As noted in Hide’s article, “Crimean Tatar activists and Ukrainian nationalist paramilitary groups” have joined forces in “leading a low-level insurgency against the Russian annexation”. In the fall of 2015, the two groups together imposed a unilateral “trade blockade of the peninsula, stopping traffic, demanding to see travelers’ documents and confiscating goods”; in November 2015, “unknown saboteurs cut four nearby power lines providing electricity to Crimea, leaving the entire peninsula in the dark”. Many Crimean Tatar activists realize that joining forces with the paramilitaries and adopting their tactics “meant giving up the moral high ground”. But Hide cites Evelina Arifova, one of Crimean Tatar activists pushing for a trade and electricity embargo on the peninsula, as saying: “Without their radicalism, we wouldn’t have achieved anything”. This conclusion in favor of radicalism can be based not only on Kostynskyi’s less-than-successful media campaign in Ukraine on behalf of Crimean Tatars, but also on the contrasting experiences of Muslim groups in the North Caucasus, particularly the Chechens and the Circassians. When I mention the two groups in my classes, I typically get many nods of recognition for the first group and mostly blank stares for the second. As mentioned above, the Circassians, like the Chechens, were subjected to a prolonged war with the Russian Empire and ultimately the majority of them were expelled from their ancestral homeland. The exiled Circassians—those who survived the brutal expulsion—found new homes throughout the Ottoman Empire, especially in present-day Turkey, Jordan, Syria, and Israel. Yet unlike the Chechens, today’s Circassian activists chose to follow a peaceful, non-violent path for maintaining their ethnic identity and culture, seeking recognition of the genocide committed against them, and campaigning for Russia to allow some of them to return to their homeland in the Northwest Caucasus (the latter issue is particularly relevant for the Circassians in war-torn Syria). The 2014 Winter Olympics in Sochi, where the Circassians’ ancestors were boarding the Ottoman ships, offered them an excellent opportunity to draw international media’s attention to their cause. 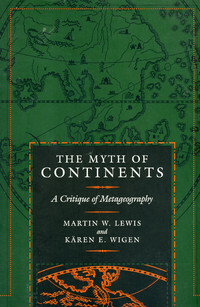 And yet, most mainstream media organizations downplayed or ignored the Circassian issue, as discussed in detail in Martin Lewis’ earlier GeoCurrents post. The Chechens, in contrast, have gained much more media attention. “They got their PR campaign together”, a student in one of my adult education classes once joked. “By blowing stuff up”, I replied. 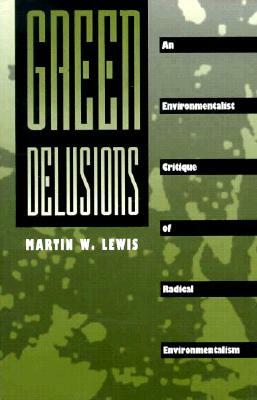 Here, I agree with Martin Lewis that the media is to some extent complicit in driving nationalist movements to become more radicalized and more violent. As Lewis puts it, “if news source chose to highlight violent responses while ignoring non-violent ones, a perverse message is seemingly sent: ‘If you want our attention, kill someone!’”. While Crimean Tatars have not yet been involved in violence against persons, they are evidently prepared to blow up power lines and destroy goods. It is, however, a step in the radical direction. Several other factors suggest that we might see a rise in violence perpetrated by Crimean Tatars and an internationalization of their more militant activists. Unlike the Chechens and the Volga Tatars, the Crimean Tatars do not constitute the majority or even a plurality in their region. It is therefore hardly likely that they will be able to gain much cultural or economic autonomy, regardless of whether Crimea remains under Russian control or is transferred back to Ukraine—and independence is entirely out of the question. In fact, the vector of Russian policy with respect to Crimean Tatars is clear from the recent persecutions of the Crimean Tatar activists, including the exile of their leader, 72-year old Mustafa Jemilev, a veteran of the dissident movement. Jemilev is now banned from Crimea by Russian authorities, while his wife remains in Crimea and his son is in prison in Russia. While for now Crimean Tatars align themselves with Ukrainian paramilitaries, it would not be surprising if the more militant wing of their movement begins to look for alliances in the larger Muslim world. 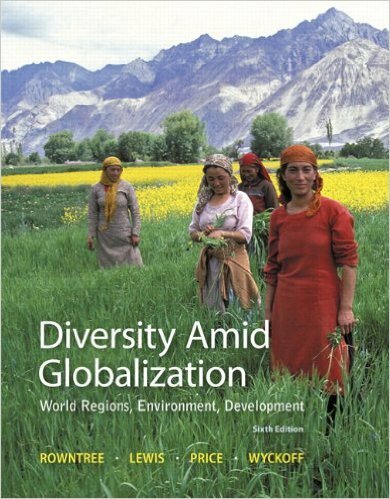 The comparison between Tatarstan and Chechnya above also suggests that stunted economic and social development facilitates radicalization of Muslim groups. While the authors of a recent article in Foreign Affairs William McCants and Christopher Meserole focus on “political culture”, they too admit that economic factors play a role, particularly the high degree of unemployment. As many other authors have suggested, high unemployment among young males creates a demographic base for jihadi recruiters to draw upon. 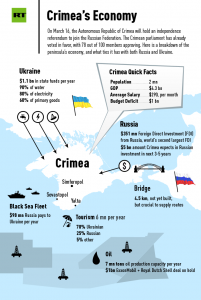 By all accounts, Crimea was economically underdeveloped already on the eve of the Russian annexation in March 2014, even according to Russian sources such as Russia Today, a media outlet that peddles pro-Putin state-sanctioned propaganda in English. According to their article “Crimea’s economy in numbers and pictures”, published on March 15, 2014, Crimea’s budget deficit at the time constituted $1 billion, while the republic’s annual GDP was only $4.3 billion (see image on the left, reproduced from the Russia Today article). 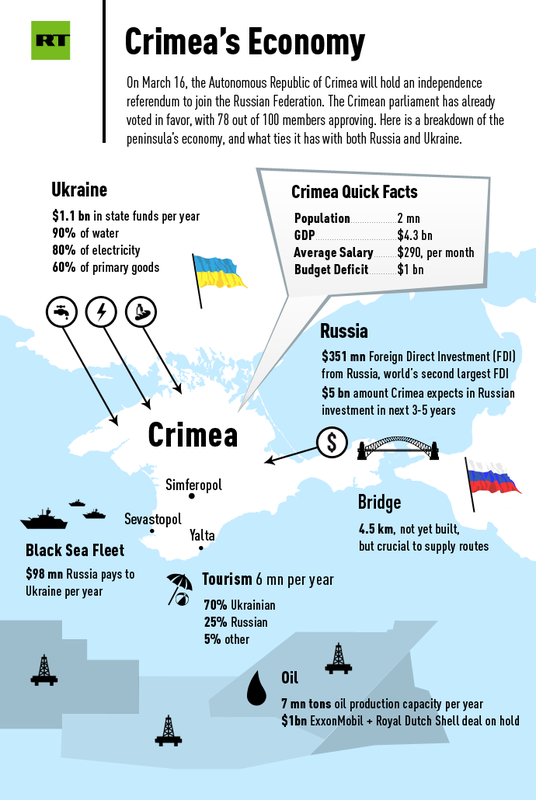 By 2018, Crimea expected Russian investment of about $5 billion. Yet Crimea also had a lot to lose by severing its ties with Ukraine: on the eve of the annexation, 90% of water, 80% of electricity, 60% of primary goods, and 70% of tourism came from Ukraine. The Russia Today article hypothesized that “if Crimea becomes a part of Russia it’ll become a more attractive holiday destination for Russia’s population of 142 million, whose per capita income is more than three times that of Ukrainians”. However, in reality, the hostilities turned off tourists and the logistical difficulties in getting to and from the peninsula with a ferry caused a further drop in Russian tourism. As reported by Segodnya.ua, “almost 60% of tourists from Russia do not consider the resorts of the annexed Crimea … to be a decent replacement for Turkey and Egypt”. Thus, although Sergey Aksyonov, Crimea’s prime minister and an advocate of joining Russia, had hoped that breaking away from Ukraine would transform the economy for the better and would turn the peninsula into another Singapore, this has not happened. The economic sanctions imposed by the European Union, the United States, Canada, Australia, and several other countries directly against Crimea and Crimean individuals have further inhibited tourism and infrastructure development. The political and economic problems, as well as direct persecutions, have caused many Crimean Tatars to leave the peninsula; according to BBC.com, 10,000 Crimean Tatars have been forced out of Crimea and moved to Kherson, Lviv, Zaporizhye, and Kiyiv districts of Ukraine (see map on the left from travel-tour.com.ua). This mass displacement parallels what had happened in Chechnya in the wake of the two Chechen wars. Thus, the destruction of family and community ties as a result of this relocation may bring Crimean Tatars to the point where religious identity would matter more than ethno-linguistic identity. As is, only a small minority of Crimean Tatars speak their indigenous language, which is considered to be endangered: although it is taught in several schools, it is mostly spoken by older people, according to the Ethnologue. Islam, on the other hand, has always been an important part of Crimean Tatar identity. Historically, Crimean Tatars were described as “diligent Muslims”, but while some important Muslim traditions—charity, fasts (including that of Ramadan), and pilgrimage to Mecca—were strictly observed, others were downplayed or ignored. For example, the German geographer Gustav Radde, who visited Crimea in the mid-1850s and wrote an ethnographic treatise about Crimean Tatars, informed his readers that Crimean Tatars drank vodka and a low-alcohol homebrew, though not wine. Another Islamic proscription that was generally ignored by Crimean Tatars is the ban on gambling, playing cards and dice, which were considered acceptable and indulged in widely, Radde wrote. Yet the treatment of women and the family law in traditional Crimean Tatar society, as described by Radde, is reminiscent of what is practiced in the most strictly Islamic countries. 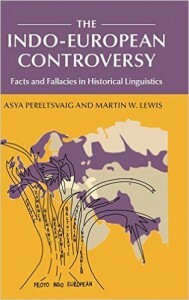 Thus, although Crimean Tatars today have certainly not seen the de facto implementation of Sharia law that has been experienced in Chechnya under Ramzan Kadyrov, including polygamy and enforced veiling, they could move in the more radical Islamist direction, especially as dislocation, persecutions by Russian authorities, and the continuing loss of their indigenous language make Islam the linchpin of their identity. “Russian political culture” may yet prove to be as deadly as the French one, albeit not by banning the veil but by allowing it—and by leaving little room for moderate Muslim identity based on history, culture, traditions, and language rather than jihad.